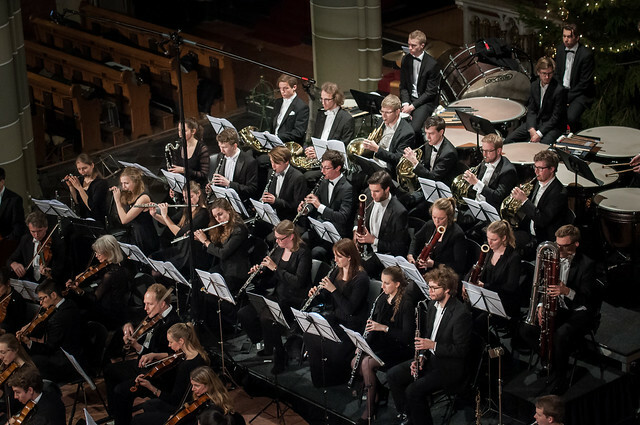 The orchestra of 'Delfts Studenten Muziek Gezelschap' Krashna Musika currently has approximatly 60 members. It has an occupation of a standard symphony orchestra with which high quality music is performed. The repertoire usually consists of great classical works, but there is room for more modern works. Recent examples are 'Tod und Verklärung' by R. Strauss, 'Isle of the dead' by Rachmaninoff, the 5th symphony by Shostakovich, and Mahler's 'Das Lied von der Erde'. Krashna gives two concert series every year where both the choir and the orchestra perform. The choir piece is then usually also accompanied by the orchestra (usually in a smaller setting). Pieces that have recently been performed with the choir are the Mozart Requiem, 'Kytice' by Martinu and 'Messa di Gloria' by Puccini. Want to join our orchestra?